No more compromises – meet the LXNAV S100, the ultimate standalone digital variometer. With unparalleled functionality and connectivity, the LXNAV S100 is the most advanced standalone variometer ever produced, packaged into a single unit for mounting into a standard 80mm instrument hole. For mounting into a 57mm hole, the smaller LXNAV S10 is the ideal solution. The LXNAV S100 digital variometer includes a built in IGC flight recorder for badge, competitions and record claims, a backup battery in case your glider’s power supply should ever fail in flight and Bluetooth connectivity for connecting easily to your Naviter Oudie, Android or Apple device. The S-series variometers’ all-glass displays allow for more functionality including a moving map display for task and airspace navigation, a Flarm radar, thermal assistant and an artificial horizon display (optional software upgrade). The larger display also allows much easier to read navboxes, a faster responding vario pointer and the display of more information including flap speeds and a visual wind speed and bearing vector. All of the new generation varios are also designed with connectivity to your other avionics in mind. The varios are built with two data ports on the back, one for a GPS input, the other for connecting to your preferred PDA moving map display. The optimum setup is to connect a FLARM device in to the LXNAV vario through the GPS port, this allows GPS information and FLARM data to be fed to the variometer. 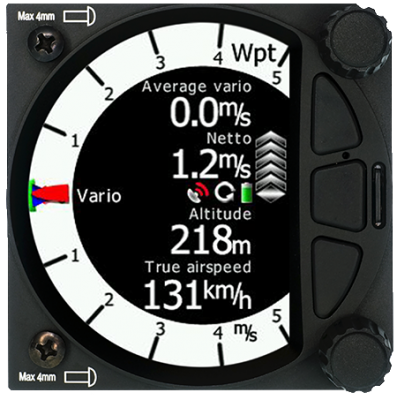 The variometer can then use the GPS data for navigation, final glide computation and wind vector calculation and the FLARM data for displaying FLARM targets, providing warnings and even reading them out to you so you don’t even have to look down at that critical moment! The PDA port is best connected to the Naviter Oudie range of devices via the CC-NP-Oudie cable but can also be connected to Android or Apple devices via the S100’s built-in Bluetooth. This allows the PDA to receive the GPS data from the GPS input port for more accurate task navigation, as well as FLARM target information – this means detected FLARM targets will appear on your moving map with configurable information such as climb rates, Comp IDs and the targets’ range from you. The PDA and vario will also exchange variometer information such as MacCready setting, water ballast and wind vector information. Lastly when you have set your task in your PDA while in briefing or on the grid, you can simply upload that task from your PDA to both the variometer and the device connected to the GPS port (FLARM IGC or IGC flight recorder) in one go, saving having to manually put your tasks into multiple devices when you just want to go flying! The LXNAV S100 makes the ideal replacement for your aging 80mm electronic variometer that does not easily connect to your FLARM and PDA. The S100 can be upgraded through the addition of a remote stick, activation of the artificial horizon display, Flap sensor, CAN Radio bridge and MOP 2 sensor for gliders with electric propulsion.